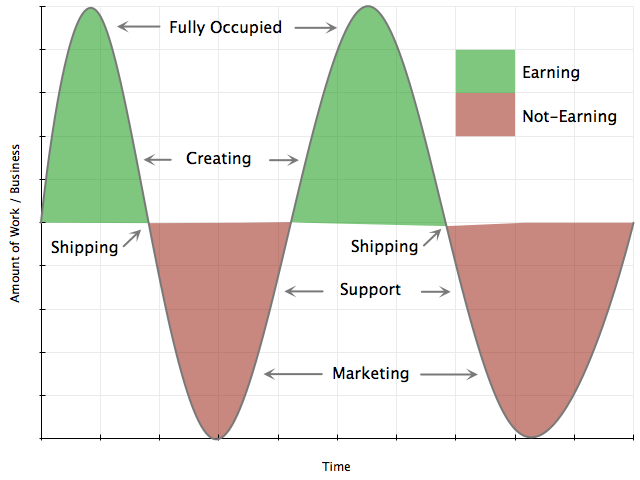 The indie business is cyclical, a sin wave of quiet and busy times. The peaks are high and the troughs are low. When an indie is busy, there is nothing better, no higher high. They are working with great clients, creating amazing products, solving the unsolvable, slaying dragons and earning enough money to pay the bills. But when an indie is quiet, there is nothing worse, no lower low. No clients to please, no products to create, no problems to solve, no dragons to slay and no income coming in. Sure, we choose our pricing to take these down times into account. We know we’re not going to be fully employed. But it’s a balance trying to predict just how under-employed we will be and how much we can charge. Some years we have little or no down time and do well; other years, we have too much down time and do badly. These ups and downs are caused by a singular constraint, the indie themselves, the fact that they are a one person band. It’s hard to spend the time to market themselves and to create brilliant products for clients at the same time. So the marketing stops. As a result, when the products are shipped and the current clients satisfied, most indies have no next client or project to work on. They have had no time to market. Creating product is fun, it’s what we love to do. Finding new clients is not fun, it’s hard work, and most leads are dead ends. Finding clients takes time, the process slow. There’s the initial conversation, thinking time, more discussion, proposal, more conversation, iterations, and finally if and only if all these steps get completed, the signing of the contract and kickoff. While marketing, there’s no work to do, no income coming in, no nothing for an indie until the contract is signed and the retainer paid. And the lows are not short lows, they always take too long, or certainly feel that way. One could argue that the indie gets to create a whole new indie business from scratch each cycle. Make new contacts, let people know they are available, and start following leads. And to make the lows lower, I believe a 90-10 rule applies to the marketing process. Only 10% of first conversations move on to a second conversations, 10% of those get to the proposal stage, 10% of those iterate and 10% of those generate a contract. There are some famous indies out there who do not have this problem. Leads seek them out and leads are prepared to wait to get their slot to be served by those indies. Good for them. They have succeeded in building a brand as well as a sustainable business. As an indie, I am proud of their success and wish them the best. That is the business I and all other indies are striving to build too. But the majority of indies do not have the brand recognition or the patient leads. If we are busy and a lead calls up, they do not wait for us to become available, they simply go elsewhere and we never hear from them again. And when we’re quiet and leads are not calling in, or the first conversations are not going anywhere, or the pre-sales process is dragging on for far too long, we indies wonder why we do this. We wonder if we can get to the next contract before our emotions or businesses fail. Each time we hit a low, we wonder: Is this the end?